These gourmet sausage rolls are delicious with a cold beer. Double the recipe if you’re having a big party. For the puff pastry, tip the flour and salt into a large bowl, add the cubes of butter and rub the butter into the flour using your fingertips, until the mixture resembles breadcrumbs. Gradually stir in 150ml/5fl oz cold water, until the mixture comes together as a soft dough (you may not need all the water). Use your hands to pat the dough into a 2cm/¾in-thick rectangular block. Roll out the dough onto a lightly floured work surface to a rectangle measuring about 30x20cm/12x8in. Sandwich the remaining block of butter between two pieces of greaseproof paper. Using a rolling pin, roll or bash it out to a rectangle measuring about 15x20cm/6x8in. Place the flattened butter into the centre of the rolled pastry. Fold one edge of the pastry over the butter to half-cover it, then fold the other edge of the pastry over the butter to cover the other half, so that the two edges of pastry meet. Pinch together the top and bottom edges of the pastry to seal the butter inside. Fold the pastry in half lengthways, then turn the pastry 90 degrees to the right (a quarter-turn). Roll out the pastry again to a rectangle measuring about 30x20cm/12x8in. Fold the pastry as before, bringing each edge into the centre so that the edges meet, then folding in half lengthways, before giving the pastry a quarter-turn. Repeat the rolling and folding process once more, then wrap the pastry in cling film and chill in the fridge for one hour. Meanwhile, for the filling, heat the butter in a frying pan over a medium heat. When the butter is foaming, add the onions and garlic and fry for 4-5 minutes, or until softened. Add the brandy, then stand back and set the pan contents alight with a long match. (CAUTION: Do not flame the pan ingredients with the extractor fan running. Keep your hair and face away from the flames.) Allow the flames to flare up and die down, then transfer the pan contents to a large bowl and set aside to cool. When the onion mixture has cooled, add the minced wild boar and tarragon and mix well, then season generously with salt and freshly ground black pepper. Preheat the oven to 230C/210C Fan/Gas 8. Line a baking tray with baking parchment. Roll out the puff pastry on a lightly floured work surface to a rectangle measuring about 40x30cm/16x12in and about 5mm/¼in thick. Cut the pastry in half lengthways to create two rectangles measuring 40x15cm/16x6in. Divide the filling mixture into two and form a line of filling down the length of each sheet of pastry, making sure the filling mixture is slightly off-centre. Brush the narrow edge of the pastry rectangles with the beaten egg. Fold the wider edge of the pastry rectangle over the filling and press it against the narrow edge of the pastry, crimping to seal and trimming the pastry if desired. Transfer the sausage rolls to the prepared baking tray, seam-side down. Brush the tops with the remaining beaten egg. Bake in the oven for 20-30 minutes, or until the pastry has risen and is golden-brown and the filling is cooked through. 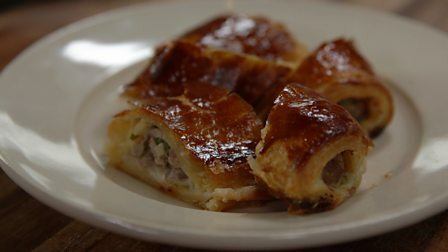 To serve, cut the wild-boar sausage rolls into slices and pile onto a platter. Serve hot or cold.